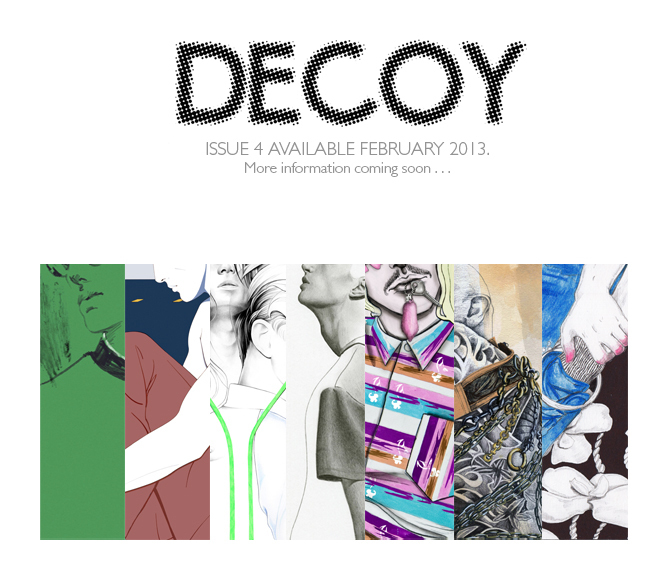 Home › Uncategories › Issue 4 coming soon. . . .
Issue 4 coming soon. . . . The new issue will finally be available mid February, but I couldn't resist teasing some of the fantastic new work available in the issue. Including new work by myself and five of my favourite illustrators who I'm inspired by, issue 4 is the first of Decoy to be in a true magazine format. I'm also incredibly grateful that the prestigious Fashion Illustration Gallery (F.I.G) will be announcing details of the issue once it is available, alongside showcasing some of the works on their site, so stay tuned. For now, have fun guessing who the illustrators are . . .